New tool for arthritic hands! Thread: New tool for arthritic hands! My roommate assembles cable so she is my tool expert. She also suffers from arthritis in her hands. I noticed her using a pair of unique pliers to pick threads after we'd ripped out a large section of piecing. I was so impressed with their performance, she bought me a pair for Christmas. They will pick up a single stitch, or thread laying on a granite surface, or any tiny detail required like holding needles or pulling needles through thick fabric. They are spring loaded, so make quicker work of picking loose thread than fingers, with much less muscle fatigue. We found them at Home Depot but they only come in a set with a pair of cutters. Still, the set is only around $10. I have bought them for family members who can no longer do the pinched finger thing, one from arthritis, one from a stroke. I just had to share our find with the wonderful members of this board. I have those too. My husband gave them to me from his tool box. He is a retired appliance repairman. He also gave me a telescoping magnet that is wonderful to pick up dropped pins. It looks like a screwdriver with a circle on the end. I can't always see the pins on the carpet, but the magnet gets them right up. I love gadgets! Mine aren't the same as yours, but they are my saving instruments. Needle nose plers, straight and bent nose sit right beside my sewing machine. A tiny rachet set (found by my husband) means I don't have to call him to get my bobbin plate off. All my scissors are spring loaded. Gardening gloves (tight fitting and with little rubbery bumps) are a must... I simply can't grip well enough to manipulate fabric without them. My cutting ruler has a handle that is wide and lets me push down and cut w/o risk to myself. If I am quilting a full size quilt DH helps me manipulate the "roll". Carry on! We can overcome!!!! Great suggestions - and what a help to those with issues. My Mom has essential palsy (hands shake) we just found her a set of weighted silverware. Her hands no longer shake when she eats. Great to know. Wrote down info put in purse and will go to lowes or home d next trip to town! Thanks! Thanks for the tip. We're going to Home Depot this weekend. Kind of OT, I'm afraid. I love the block your pliers are laying on!! Where'd you find that cat fabric? I'm a cataholic! I love tools too and have found several that I got when I was tinkering with vintage machines that are great now with sewing. Will have to check out those pliers...they sound great! Also, re the telescoping magnet wand, I got mine in the auto dept at Walmart. Just found it again after many months of being missing (the wand, not me!) and it is great for picking up pins or anything metal since I tend to drop things a lot! Great Christmas gift for friend with arthritis... & me, too. Great tool for picking out those little threads. I use one of those old fashion sticky rollers, to pick up loose threads I find them at yard sales. My friend uses wide masking tape to remove them. 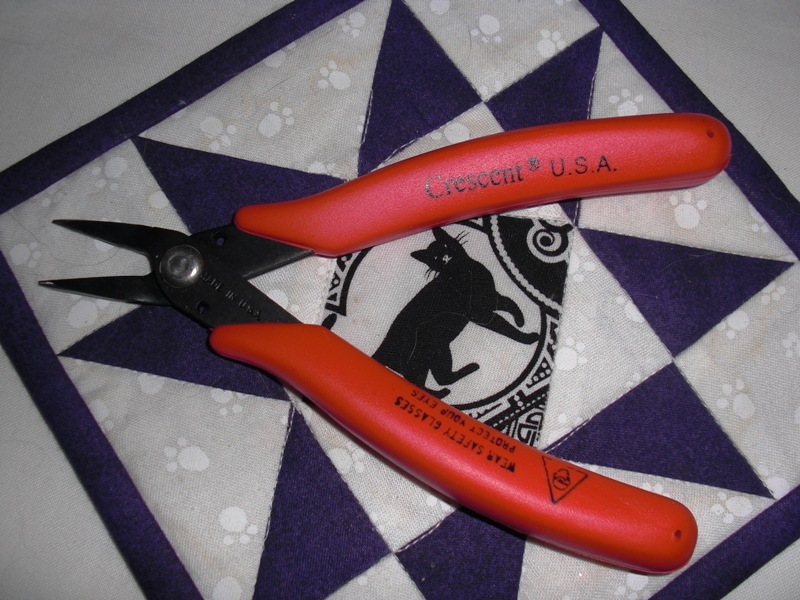 These pliers would be much better on those pesky threads that are left over after the sticky swipe. These pliers are on my christmas list. Thanks for the hint. Love repurposing gadgets!! What a great idea for those of us with carpal tunnel and/or arthritis of the hands. I'll be checking these out the next time I go to Lowe's. No they don't seem to help me. But the gloves are great for the RA in the rest of my hands. The only thing that helps my thumb is a thumb splint ( from Walgreens). and a special cream prescribed by my rhumetologist. Thanks for letting us know about those useful tools. After years of being a secretary I suffer from carpal tunnel syndrome, as well as rheumatoid and osteoarthritis, so I appreciate finding out about the tools that are out there. Thanks for sharing the information. Love these helpful tips, thanks for sharing. Fiskars makes scissors with springs in them, so all you have to do is squeeze them in order to cut. Plus the handles are padded so easy to use. The needle puller that I have used for hand quilting split down the metal strip and I had bent it back in place so many times, it wuldn't work any more. I had a pair of slant tweezers nearby and tried using that as a needle puller. It worked!!! I got them at a dollar store for $1.00. I tied a string of ribbon through the center and then around the closed end and can put them around my neck for a handy place to have them. Have you tried putting caster oil on your hands? I have used it on one of my knees that gets tight and doesn't want to bend. I had expected it to help there, but didn't think about my fingers that didn't want to bend easily. After a while, I noticed that the fingers on my hand that I used to apply the caster oil to my knee would bend easier. It's worth a try, it worked on my fingers, and just might help yours too. I find it near the laxatives in the drug area of stores. What is the name of the little plier-like thingee Faygilmore? Will, also, have to look into the telescoping magnet. Thanks to all! Yes I agree they're great. I use them in my counted cross stitch all the time but mine are a little smaller to fit my small hands and pick the tiny cross stitches. And I do have a larger set on my sewing table as well. Don't know what I would do without them. Thanks for the answer sewnut! Thanks for the answer sewnut...very kind of you. They look like jewelry making tools that I have. There are nice sets at Michael's or AE Moore for 40% off. Thanks for sharing the helpful information about the use of this product. Is the cream from your doctor diclofenac sodium...brand name Voltaren Gel? That certainly helps my joint at the base of my thumb. Good stuff!